Yes that right, in a recent change that was not communicated to Customers, 123Reg, a subsidiary of Webfusion Ltd, is now holding your domain name hostage for £9.99+VAT. So we have a bunch of client domains sitting with 123Reg, to reduce admin overhead all domains are being moved to one registrar. On moving the 123Reg domains we were suddenly confronted with a £9.99+VAT charge to change the IPS Tag! 123Reg didn’t inform Customers of the ‘new’ £9.99+VAT charge … or give any notice of the new charge. Indeed this is a stance that 123Reg are not disputing, simply put, 123Reg slapped on the charge without telling anyone, probably hoping that nobody would notice. What is there not to love about 123Reg’s statement (see cached screenshot below) “Some Registrars Will Charge Huge Fees Just to Leave Them” … yes in your own words you said you’d not do this – come the evening of 27th March 2014 you start too! 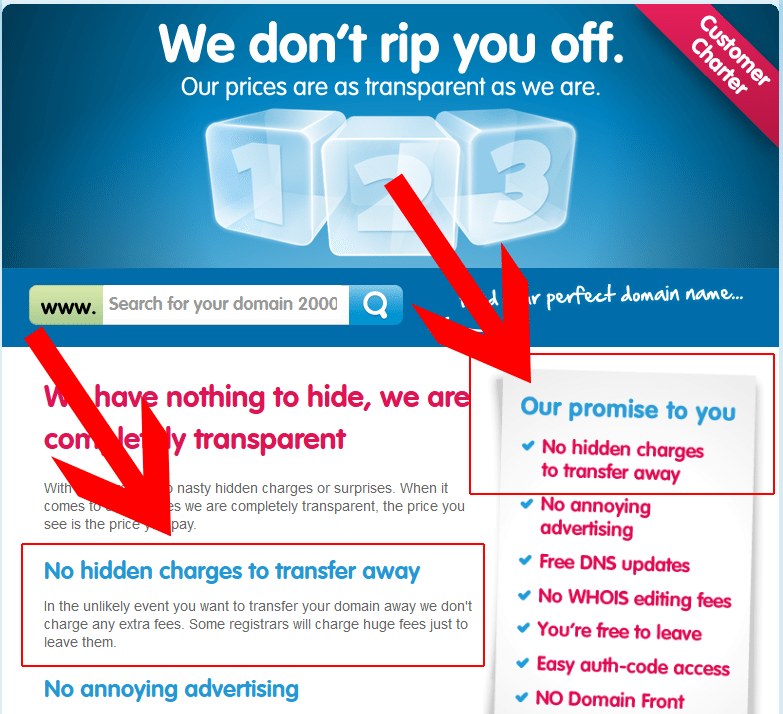 If you take a look at the current 123Reg page for the Customer Charter, the text, “In the unlikely event you want to transfer your domain away we don’t charge any extra fees” has been deleted from history. Customers on both 123Reg’s Facebook Page and 123Reg’s Twitter account vent their fury! 123Reg have re-written history on their Domain Transfer out fees and hoped nobody would notice – well we did and 123Reg need to fall on their sword and make this right. Nominet should sharpen it’s teeth and give 123Reg a good talking to – after all Nominet you are supposed to be making the UK domain spare a safer place to do business? We have informed Nominet – whether they do anything remains to be seen – after all you don’t bite that hand that feeds you? Here’s a screenshot of the current Twitter Conversation on this with 123Reg – it seems they want to talk about this in private. Well after a email from them saying offering to “Forward your feedback to the Product Manager” I have yet to hear a response. Your move 123Reg, do the right thing and let us all move on to something more productive. I’ll update this story as and when – and please do add your comment below. Update Tuesday 1st April 2014: After much discussion with 123Reg, 123Reg released the domains to us. We did not pay a fee. The domains are currently being transferred and we will update once all have arrived with our new registrar. Update Wednesday 2nd April 2014: We can confirm that all our ‘UK’ domains have transferred to our new registrar at no cost to us. 123Reg removed the £9.99+VAT block from our account and we were able to update the IPS tag ourselves via the 123Reg Control Panel. All our ‘UK’ domains have transferred to the new IPS tag. We did not pay a fee. Update Thursday 3rd April 2014: For folks that kick up a huge public stink on Twitter or Facebook, 123Reg are allowing domains to be transferred and ‘waiving’ the unfair fee. Our expectation is that the majority of the userbase are paying the release fee. 123Reg are quoting their T&Cs as allowing them to add the new fee without informing customers (actually the T&Cs pretty much allow them to do anything, that they ever wanted, without telling anyone at any point – that is hardly fair is it?). I Am Not A Lawyer: As the ‘free transfer out’ was prominently displayed on their website in many places, along with the “Customer Charter” and “123 Reg Price Promise”, this takes precedence over T&Cs. If you are a Lawyer – please add your thoughts to the comments section below. Update Friday 4th April 2014: The Register ran the story about Holding Domain Names Hostage – if you take a look then also look at the comments that have been made on the article. I am not a lawyer but there is some good advice on how to get your domain back. Update Sunday 6th April 2014: The story has now made it to Slashdot – a whole ton of comments on there on why 123Reg cannot make this change. As it’s a material change to the contract 123Reg cannot enforce this fee to anyone that bought a domain name prior to the £9.99+VAT Fee being introduced. I’m trying to help them see sense but I’m up against a brick wall. Please do share this post and get the word out there! Hi Jon, we’ve updated the Blog post with the current status of our discussions with 123Reg. Although I did pay Nominet to transfer some of my domain names, I did forget to transfer one of them.. 123-Reg support refused to change the remaining IPS tag for free. Spoke to Host Europe who have confirmed in writing this evening that they will are taking steps so I can change the IPS tag. So hopefully tomorrow I will be able to do this. Good luck James – and they are steps that you shouldn’t have had to take in the first place! I’ve got a huge list of domains with 123 that I’m going to be moving now. Out of interest, which registrar did you move to (and why)? So we’re moving the domains over to VidaHost – they are more about services such as hosting etc rather than making a living from domain names. VidaHost have great support – and can’t recommend them enough. 123Reg are responsible for a very large percentage of Nominet’s income … and so domains play a key part of their business strategy. A shame as we’ve been a 123Reg customer since 1999. Did you tell 123Reg that you do not accept the new charges, as Ian this is the door that opened up the transfer for us. I am trying it. Thanks. Truth is I only have one domain with them because I moved all the others out as they came up for renewal. I moved a .net today because that still seems free. They gave me 2 free years on the .co.uk because they totally screwed up the renewal and even though they accepted I had paid, they made me pay a second time and refunded the first a few days later. I ran the risk of losing the domain. So its not the end of the world to leave one sit there. Really shocked. They checked my records… been a customer since January 2001. Good Luck Ian and let us know how you get on! To my mind, anyone on board with 123Reg prior to this ‘policy change’ should be able to leave without charge. It’s disgusting to see so many companies willing to nickle and dime their customer base – we need to vote with our wallets people. Yes that’s where I got ours Paul, though I didn’t want to publicise it in case suddenly the Wayback Machine got deleted. I have full screenshots of many pages – and if anyone needs them just drop us an email. Suspect 123Reg need a better BOFH – as otherwise they’d have got clean away with it! Just FYI, my submission is now on the front page of Slashdot, one of the most widely read geek websites in the world. Hi there Simon, good work! This is a story that keeps on giving. Just had a response from the support ticket and they say I can move with no charge. Should have gone straight to raising a ticket rather than screwing about with live chat. Def worth stating that you don’t accept the new T & C’s and you wish to end your business relationship with them. Great news Ian – thank you for updating on your progress – we’re really pleased we were able to help you get your domains released! They just pointed me to the new terms, and reminded me that they can change them at any time without consent or notice. Hi, 123Reg don’t have a leg to stand on. For example if 123Reg retrospectively changed the T&Cs to say if you have to hand over your car keys, house keys, and all future earnings – would it be enforceable? Nope, not without agreement from both parties. Good luck with retrieving your domains. Did you specifically state that you *do not accept the changes* and wish to terminate your relations with them? Stealth changes to IPS tag fees effectively takes domains hostage. This must be illegal practice & should be referred to trading standards! They do charge £12.00 but its NOT per domain. First log into your 123 Reg account and make sure all the admin email addresses are set to one you have access to. Then go to Nominet and register with the same email address. You can then transfer all away from 123-Reg. Please don’t pay their stealth charge, 123 have got to learn and learn the hard way. @James – be assured I have absolutely no intention of paying them another penny. I was already in the process of moving domains out of there because of other issues when they brought this in. I took it very personally! 1) it seems their “change anything any time we like” clause is highly likely to be an unfair contract term and really needs challenging. 2) as has been pointed out on here and elsewhere they CANT change terms without notification. Nevertheless they have done this. I suppose this means that anyone who is still in there and hasnt noticed, and renews will have accepted the new terms and therefore been shafted. Re nominet: I spoke to sarah at nominet. I got the distinct impression nominet seem like they dont wanna get involved. The basic line is: “not our problem. try the CMA, try trading standards, try citizens advice” Perhaps they dont want to bite the hand that feeds them – no surprise there then. Personally I think nominet should have an opinion when this kind of things kicks off. sarah did promise to pass messages on to the relevant account manager so I think it would be a good idea to fill up sarah.norton at nominet dot org dot uk ‘s inbox with complaints. Great news londoh, that you got your domains released for free by 123Reg. What 123Reg are not doing – is allowing anyone to challenge them legally as they are releasing the domains as soon as the magic words (as above) are uttered. I’d heard 123Reg have approx 10,000,000 customers. If on average each of those customers have 10 domains each, that’s £100,000,000 that 123Reg can add to their ‘balance’ sheet … I expect to see the company for sale soon? I agree they are avoiding a possible legal challenge by reverting the terms when pressed – which neatly removes that vector. I agree existing customers still havent been notified of the new terms – and they probably never will be unless something changes. So, practically 123 can consider its “fait accompli” – and personally I dont like that. It seems to me the only way they will revert this in full, and be dissuaded from similar exploits in future is if nominet gets off its behind. the terms of your contract with Your Customers that you must bring to their attention before they enter into that contract. So it’s clearly stated by nominet that registrar has inform of charges to transfer away when entering into a new contract, and ensure customers are aware of changes to ongoing charges. In this case 123 is changing the terms without notification (not legal) and citing an onerous and dubious clause in the contract to do it. I completely agree with is, Nominet need to act. 123-Reg cannot and should not be allowed to act this matter and get away with it. Clearly someone has made a decision which they must now be held accountable for. I strongly believe that 123 Reg have not acted in accordance with English law and I also believe that they have possible breached the Registrar’s agreement. Has anyone had a response from Nominet or know what their current stance is? I will be chasing them today and pushing them to act. They are now charging to have the WHOIS privacy turned on a .uk domain name which if done through Nominet is free. I understand most charge for WHOIS privacy on other domain extensions but .uk I thought you were entitled to have under data protection. Hi James, we weren’t aware, but to be honest not surprised! That is another reason why we are glad to be an ex-customer of 123Reg. Sadly Nominet will never take any action against 123-Reg/HostEurope as they are the single largest Nominet customer and along with 1and1 they basically control Nominet. Surely there must be someone who regulates Nominet. If Nominet won’t take action then someone needs to report Nominet. I’ll happily do it if I know who to complain to. Nominet is a somewhat strange organisation. They are a private, not-for-profit organisation with a monopoly on .uk domain names. They are not run by the government, although they do have some association with the Department of Culture Media and Sport. The DCMS generally stays out of Nominet affairs and seem to somehow believe that the current membership is effective at regulating the company, despite the clear bias towards a handful of large companies which essentially gives them complete control over Nominet. Emily Taylor’s blog has a few articles which provide good coverage of the problems with Nominet (the recent http://www.emilytaylor.eu/open-letter-nominets-top-members/ for example). The Nominet Watch (http://nominetwatch.com) web site is also a good coverage of the governance etc. problems which run deep at Nominet. Emily Taylor worked for Nominet as their Director of Legal and Policy for 10 years, before being unfairly dismissed and subsequently wining a disability discrimination case against Nominet in 2012. Sections 19-21 of the Digital Economy Act of 2010 give the Secretary of State the power to appoint managers at Nominet and/or modify the constitution of Nominet (see http://www.legislation.gov.uk/ukpga/2010/24/crossheading/powers-in-relation-to-internet-domain-registries). This would essentially allow the government to freeze out one or more of the current Nominet directors and replace them or even nationalise Nominet if they believed there are serious failures at Nominet which threaten a “UK related” registry run by Nominet. @edward – yep I agree, thanks for the link to emilytaylor’s article which is enlightening. Altho only what I’d expected, its good to see it so clearly set out. obviously when the largest voting member of an organisation sees fit to ignore the organisations own rules, as well as the law of the land when dealing with its customers something needs to change. The recent farce that was the two Direct.uk consolations basically showed that the Nominet board have absolutely no interest in what the Nominet membership (myself included) have to say about the way that Nominet and the .uk namespace is run. They wanted to run their own, pointless me-too new domain like all those that ICANN is currently launching and so they forced it through, despite overwhelming opposition. The way that Nominet acted towards Graeme Wingate also shows what they will do to anyone who tries to threaten their power. They eventually backed down and agreed to pay Graeme’s legal costs (although they initially failed to uphold this, until some rather embarrassing public prompting from Graeme). It is important to note that Greame Wingate did not make any accusations against Nominet, but just against the CEO Lesely Cowley. Nominet then retaliated by suing Graeme Wingate and his company That Internet on behalf of Lesley Cowley, a massive waste of company funds. I guess the only alternative path is to try and convince the Secretary of State to use the power granted to them by the Digital Economy Act, which would mean overcoming the obstacle of the DCMS currently believing that Nominet is doing a good job and that the membership is somehow acting as an effective regulator, which is obviously not the case! as much as I ‘dislike’ politics and politicians I’ve recently seen (in another unconnected sphere) that writing to MPs does have an effect. It seems to my (probably very naive) view that there are laws against what is going on, and the regulator isnt working as it should. This is the digital economy we are talking here folks – westminster/the nation needs this stuff to work because the uk aint gonna bash metal and weave yarn no more. It needs input from somebody who can set out the case clearly, organise interested parties to write to their mps, and an mp who can be motivated to have enough interest to take up the cause and raise questions. I completely agree. I have no faith in Nominet and all and it seem they can just do what they want. I too believe that writing to an MP is the right thing to and engage the Secretary of State to have this whole thing looked at. For those who are interested, Nominet announced yesterday that their AGM will be held at The King’s Centre, Osney Mead, Oxford, OX2 0ES on 21/05/2014. * Re-appointing Grant Thornton UK LLP as the auditors. * Re-appointing Dr Clive Grace as an independent non-executive director until the conclusion of the 2015 AGM. For the two non-execurtive directors, the Nominet board is recommending Oliver Hope (Mesh Digital, part of Host Europe Group and the largest single Nominet member via Webfusion/123-Reg) and Sebastien Lahtinen (NetConnex, think broadband, and current Nominet non-executive director) and as usual will be engaging in a massive phone canvassing campaign of members to try and drum up support for their preferred candidates. Emily Taylor’s husband Lucien Taylor isn’t available to stand this time, so his brother-in-law Oscar O’Connor is standing instead. As such, Nominet have attached a disclaimer to his election statement in an attempt to discredit it. If nothing else, I would recommend reading Oscar O’Connor’s election statement. Interesting read Edwards, thank you for posting. The disclaimer draws attention to the election statement … the popular phrase, “Thou doth protest too much” springs to my mind. Needless to say, Oscar O’Connor is (understandably) not very happy about that statement being attached to his personal statement. We are sorry for the dissatisfaction that has been caused by the introduction of this charge. I deeply regret the way this has made you feel. As a loyal 123-reg customer I have flagged your 123-reg account for free IPS Tag changes now and going forward. You are free to move domains in and out of your 123-reg account. I would be very grateful, if you’re willing, for any feedback you may like to give on your initial reasons for looking to initiate this domain transfer (as well as any other feedback you may wish me to pass along). Was the quality of service provided by 123-reg a factor in your decision? …..feedback pending. Can’t really complain at this, transferred some .co.uk away OK.
Thanx for the heads up on this though. I submitted a ticket to 123Reg telling them how upset I was at this change. We got an email back from a “manager” who set our account to have free IPS-TAG changes. I noticed the 123-reg new charge the other day when went to transfer the last batch of .co.uk’s out. I was upset as was transferring 35 domains but then found I could do the lot from Nominet for £12. I was all set to do this when I had one last try in my 123-reg account and managed to do them for free. Basically under the admin for a specific domain the change IPSTAG was chargeable (this was where I originally tried) but under Outbound Transfers there’s another litle form to change IPSTAGs – not only was it quicker this way but it was still free. I don’t know whether this still works but it worked for me 3 days ago! Thanks for the advice, Janak! Just saved me the fees/some trouble. No problem Barry, just happy if people can avoid these rip-off fees. Hope this free method continues to work – anyone wanting to transfer out .co.uk’s should act quickly. I’d already transferred out most of my domains due to poor service and this scandalous rip-off shows I was right to find another resistrar! Apparently Nominet don’t have any prelims with such a blatant conflict of interest being completely absent from a candidate’s written statement, or that the candidates statement “I confirm that the contents of all of the documents I have provided to Nominet with regard to the NED election are complete, true and not misleading” is wrong. I wonder if they would have the same attitude for another candidate who didn’t happen to work for their single biggest customer? I suspect not given that they felt the need to attach a disclaimer to Oscar O’Connor’s statement. Have about 200 UK domains with 123-reg and was not happy to hear about this charge. I have been a very good customer over many many years — spent a lot of money with them. When I heard about this I submitted a support ticket thinking they would just drop the charges for me as I am a good customer. But instead of a simple email response I got a call from them asking why I wanted to charge IPS tags. I am thinking… well that is none of your business… but I don’t say that as I am asking them to do something for me. And as we discuss things, the lady kept disappearing and talking to her manager. At first she came back with this solution: if I transfer domains to Heart Internet then they will allow the transfers to be free. What???? I told her I wasn’t interested in Heart Internet. She asked me whether the domains were for clients… again I felt her questioning to be invasive but didn’t like to say anything. Finally, I had had enough and very firmly stated that if they insisted on these charges, I would transfer all my domains away on principle. It took getting angry to eventually get her manager to agree to waive the charges. But it has left such a bad taste in my mouth that I will transfer all my domains out anyway. And now I know that Heart Internet (and Host Europe) are part of 123-reg as well, I will be keeping clear of these companies as well. I don’t want 123-reg to get a penny more of my money now. As you may be aware, Nominet, (the orginisation charged with managing the .uk domain space) have always charged a fee of £12 for changing a domain Tag to permit a domain transfer. Historically, other hosting companies have passed on a charge to their customers for this service, which currently range from £12 to £18 per domain. Whilst Daily Internet has always resisted the commercial pressure to charge a fee for Nominet Tag changes, we are unable to continue to offer this service for free indefinitely. So to bring us into-line with industry standards, we will be introducing a Tag change fee of just £4.99 (ex-VAT) from 25th August 2014. That is exceptionally misleading on Daily’s part. Nominet do not charge members (registrars) to change the IPS TAG of a .uk domain name. The only charge that Nominet have ever applied is the £10+VAT charge if the registrant performs the transfer directly with Nominet through the Nominet online service portal. Particularly disappointing as I have just moved a load of domains to Daily as they appeared to be better than average. Looks like I got that wrong! Are there actually any good registrars? I’ve asked Nominet if this kind of misleading message would be a breach of the Registrar Agreement, particularly given that Daily are classified as an Accredited Channel Partner and so are subject to some extra requirements. I run a small company and we’re Nominet members. Obviously I’d like to think that we’re a good registrar, but I’m hesitant to mention the name as self-promotion on someone else’s blog just seems a bit wrong. I’ve received a reply back from Nominet’s compliance department this morning to say that they are looking into this. After a bit of back and forth Daily have agreed to waive the charges for my existing .co.uk domains. It’s something, but I remain unimpressed! I moved 250+ domains into daily from 123 because 123 decided to treat its customers like fools, and daily didnt charge for transfer away. Here is the link to your company http://www.freethought-internet.co.uk it is okay the internet is big enough for both of us to share. You owe me a pint mind. Just noticed this had been introduced when I tried to transfer my last remaining domain (having moved most a long time ago). Had to send several responses back to each of their replies declining to waive the charge, but after laying out how they were clearly legally in the wrong to change their stance, yet not mention this change to customers, let alone offer us a chance to move out rather than accept the change of terms. Also made them aware that I knew full well that Nominet would charge me the same amount of money, and given their behaviour there was no way they’d get my money regardless. After they handled an issue I had appallingly they were quick to offer to close my count, expecting to get over £400 in IPS tag changing fees! I contacted Nominet and moved 38 domains for a one off charge of just £12! WIN! This is exactly the reason I will never ever use huge companies like 123-reg, 1&1, GoDaddy etc. I have come across a local company who wanted £100 (yes, that’s £100) to change an IPS tag. Talk about holding customers hostage 123-reg. Would advise anyone to go to Nominet direct. Is it just me, or have they removed the fee? I logged in to 123-reg this morning to check that the IPS Tag change charge was still present – and it was gone! Anyway – I immediately transferred all my domains out for free, in case this is a blip – or they change their minds!